Hello there ladies, hope you’re all well! 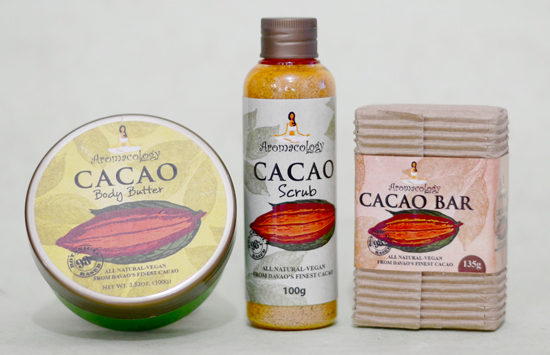 You landed on this page because you’re following the series of reviews I made for Aromacology’s newest products on the catalogue, the Cacao Body Butter, Cacao Scrub and the Cacao Bar. I also included in my previous post a brief profile of the company and how you can be a part of this awesome opportunity. Today’s blogpost will be about two awesome products I'm starting to love, the Aromacology Cacao Scrub and Bar, thought they're best paired together to achieve optimum results. My days are continually full lately - fulltime mama bear duty, monitoring peeps in the farm, acting secretary to my husband and do blogging whenever, wherever possible – those make no room for me to go spa-ing or pampering. Sad but true, sometimes I only have 5 minutes to spare in the bathroom :( But for the sake of these products, I spent time, really, to test whether they'll lived up to their promise or not. Nature and Science have shown us the amazing benefits of cacao. Cacao is a wealth nature has gifted us. And we humans just have to harness, make use of them to obtain its full promise. Aromacology just did us favour on this by coming up with cacao-based products we can happily and conveniently use. Aromacology's Cacao Bar comes in quaint package, I so like it. 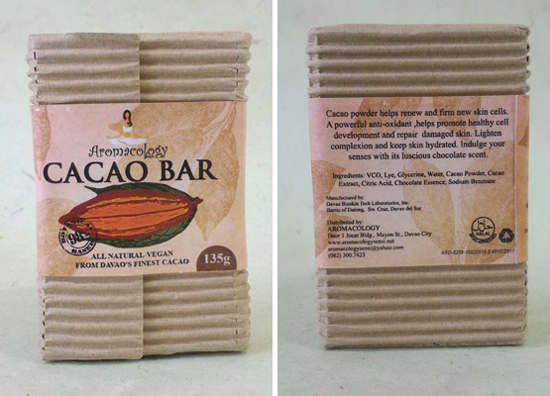 Each bar contains all natural-vegan ingredients including Davao's finest cacao. All information a consumer would need to know is printed on the label. Makes me very confident I'm picking the right bar. 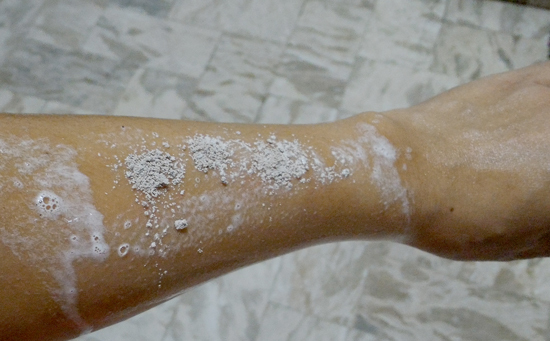 This cacao bar contains choco granules, good for exfoliation, but I suggest to not rub the bar directly on your face. Yes I used it on my face, the reason is to experience the after feel. I love it because the scent is not so strong, just a mild whiff enough to let you awaken to the deliciousness of cocoa. 135g on my hand is just too big to handle and also for economical reason I cut it into half. I was briefed during the product testing to not soak the bar in water as it melts quickly. I followed as told. This handmade soap lathers well and when applied on the body and face, few circular strokes and I can already feel the creamy and rich froth forming. All of Aromacology’s handmade soaps used the traditional technique of cold process to retain the moisturizing properties of the added natural extracts. Reason enough to shift to natural. The after feel I know is what you’re waiting to read. Well, happy to report, my skin felt supple and soft. 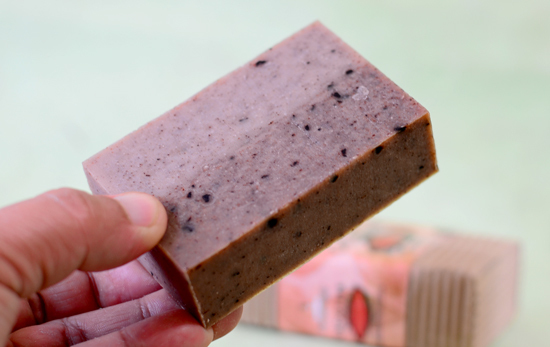 Unlike other hand-made soaps where it tightens the skin so much it could break, Aromacology’s Cacao Bar pegged it somewhere in the middle, but clearly hydrates and moisturizes. What I like about AROMACOLOGY CACAO BAR? What I don’t like about AROMACOLOGY CACAO BAR? Well, handmade soaps are essentially expensive. But you get what you pay for. Will I recommend AROMACOLOGY CACAO BAR? Absolutely. This Handmade soap uses only wholesome ingredients. It’s the best thing you can offer your body, we all deserve the best. 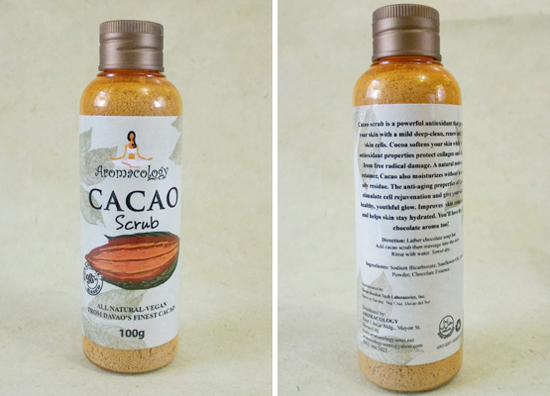 Another amazing cacao-based product Aromacology is pushing to position in the beauty market is the Cacao Scrub. Also made from the finest cacao grown in Davao. Again, I’m giving this product five full stars for always a blissful part of my day lately. Look at the texture! It smells and looks like Swiss Miss minus the marshmallows. All happy granules in there, I love it! A good body scrub should have a fine combination of cleansing and exfoliating properties that’ll work to eliminate dead skin in an effortless way. It’ll also leave your skin feeling clean, healthy and smooth. 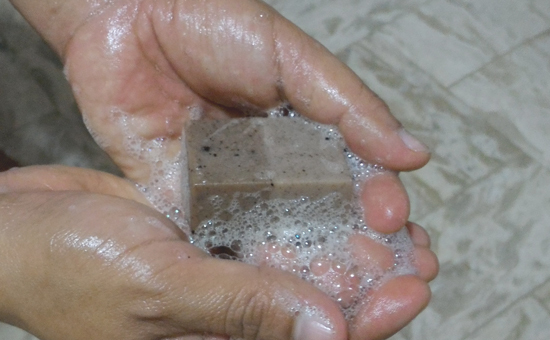 Aromacology Cacao Scrub delivers way more than what I expected, way more than my regular bar soap can do. One just have to use it regularly to get the whole feel of it. Aromacology Cacao scrub is what every beauty junkie should include in their bathroom ritual. 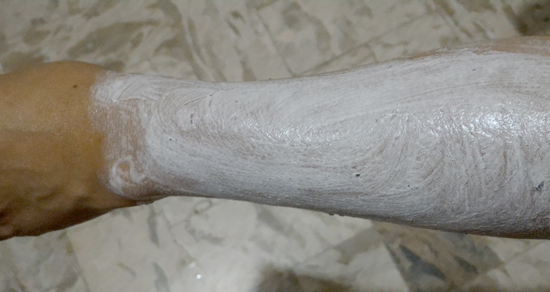 The granules when rubbed on the wet skin will start to form rich lather. I love that the crumbs slowly melts in my skin, leaving only the cacao bits towards the end. The cacao bits are biodegradable so if they’ll go down my drain and unto the ocean, I won’t feel so guilty about the impact of my beauty choices to the environment. This stems from the fact that some known imported brands uses plastic micro beads that endangers the sea creatures. This makes Aromacology’s cacao scrub, eco-friendly and sustainable. With continued use, this product will surely deliver its promise. What I like about AROMACOLOGY CACAO SCRUB? 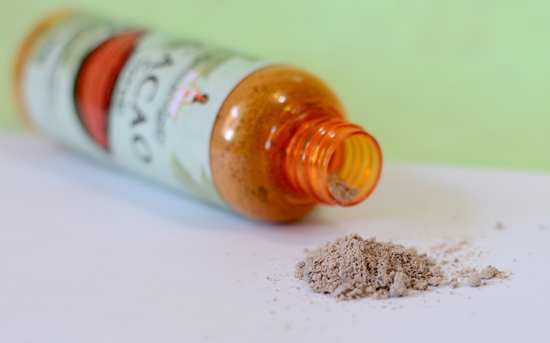 What I don’t like about AROMACOLOGY CACAO SCRUB? The cacao bits are too scarce, love my scrub bits loaded and rough. Something like an equal combo of soft and rough on my skin. Will I recommend AROMACOLOGY CACAO SCRUB? Certainly! A product worth repurchasing. There’s nothing like feeling awesome coming out of (y)our bathroom all so ready to face (y)our demanding day. As I said in my previous post, Aromacology offers business opportunities to those who would want to have not just extra but full income by becoming an independent distributor. Aromacology’s line of products are the kind you can use, sell and recommend without qualms and reservations. That must smelled so good AteV!